It doesn’t matter how many times I’ve made these raw brownies, I’m always amazed how wonderful they are. I’m not exaggerating when I say that these raw vegan brownies will change your life — seriously. After making this rich, chewy, fudgy chocolate goodness topped with a thick chocolate layer, you’ll never even think about baking brownies again. Why would you? I must admit that making vegan, gluten-free desserts (without using any pre-made gluten-free flour mixes loaded with starch and gums) hasn’t been all that successful for me. No structure from eggs and no structure from gluten is a challenge. But raw desserts are a completely different story. They’re so easy to whip up with just a few ingredients, and always taste amazing. These raw brownies have been a hit at every party I ever brought them to. It’s so rewarding to watch the faces of my friends when they first bite into a raw dessert. Nobody ever believes me when I tell them that these brownies are vegan, gluten-free, refined sugar-free, and raw. They’re rich, dense, and so unbelievably delicious! 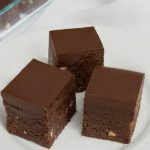 But it’s not just the taste that sets these raw brownies apart, this recipe is unique in the textural contrast as well. As opposed to soft chocolate ganache (which is a typical topping for brownies), these brownies feature classic tempered chocolate. 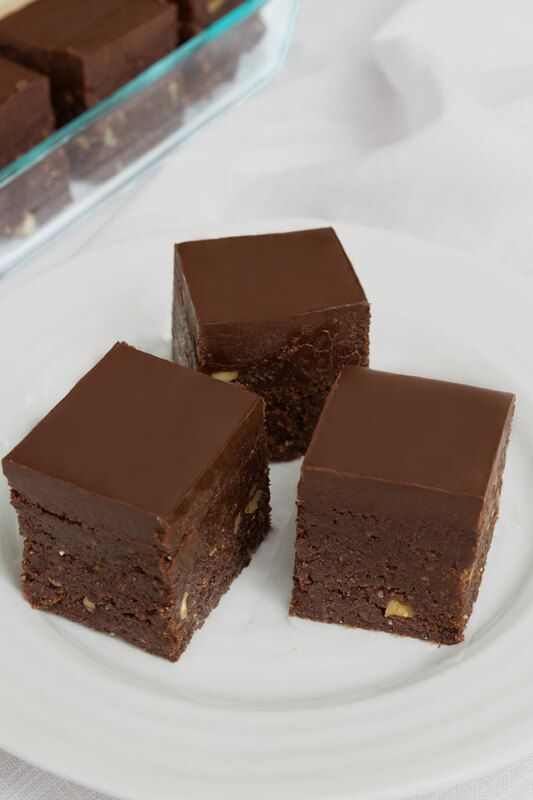 As you bite all the way through the thick layer of hard chocolate, you experience the soft, fudgy brownie base. I’m a total snob when it comes to dates. There are many varieties of dates harvested worldwide, but the Medjool dates are one of the two of the most commercially produced varieties in the North America. The other most commonly produced are the Deglet Nour dates. Both Medjool dates and Deglet Nour dates work in this recipe, but Medjool dates are far superior. They are sweeter, tender, have a deeper caramel-like flavor, and melt in your mouth. They actually taste like candy, but in an unprocessed sort of way. To get the buttery taste and flaky texture brownies are famous for, I use walnuts. They truly work the best so you don’t want to substitute them for any other type of nuts. However, you can substitute the hemp seeds for some more ground walnuts if you’d like. Finally, the chocolate. If you’re in a pinch, you can buy a tempered chocolate bar in a store, melt it on the stove, and pour it over the brownies base. I do that from time to time and it saves so much time. However, making your own tempered chocolate from scratch is such a rewarding experience. While tempering chocolate isn’t the easiest culinary technique out there, it’s definitely worth mastering. You might be tempted to add too many dates because the brownie mixture will be sort of crumbly. But “crumbly” is exactly what you want (as long as the mixture sticks together when you pinch it in between your fingers). As with many of my raw food desserts, you’ll need a powerful food processor. I use a food processor pretty much every day, for making nut butters, desserts, sauces, burgers and more. It’s great for large batches and dishes that need texture and just makes “cooking” so much faster. Ridiculously delicious, easy-to-make, and healthy raw brownies. Pulse the walnuts in a food processor until finely ground. Add the hemp seeds, cacao, cinnamon, and salt and pulse a few more times to combine. Add the dates and process until sticky mixture forms. The brownie mixture should easily stick together when you press it with your fingers. If it's not sticky enough and the mixture doesn't hold together, add more dates. Press the mixture into an 8" x 8" (20 cm x 20 cm) dish lined with parchment paper. If the brownie mixture sticks to your hands, wet your hands. Once evenly pressed, place the brownies in the freezer for about 10-15 minutes. Melt the coconut oil over medium heat in a small pot. Then whisk in the cacao powder, maple syrup, and sea salt until well combined. Remove the brownies from the freezer and cover them with the chocolate. If you have a lot of chocolate, put the brownies back into the freezer for the chocolate to firm up a little bit. Then take the brownies out again and pour on the rest of the chocolate to create a thicker layer. Place the brownies back in the freezer for about 15 minutes before cutting. To cut the brownies, run hot water over a knife for a few seconds and slowly slide the knife into the brownies. Serve immediately. Store leftover brownies covered in the refrigerator for up to 1 week. This recipe has been adapted from Oh She Glows. I’d love to try the brownies. But the hemp seeds are very expensive here, is there any substitution for it? What’s the difference between cocoa powder and cacao? Hi Laura – raw cacao is made by cold-pressing un-roasted cacao beans. The process keeps the living enzymes in the cacao and removes the fat (cacao butter). Cocoa looks the same but it’s not. Cocoa powder is raw cacao that’s been roasted at high temperatures during processing. If you’re using cocoa powder instead of cacao powder, I would recommend Dutch-processed cocoa powder which has been processed with an alkalized solution, making it less acidic and higher in richness. I used flax seed and it was great. Wow I just tried this recipe and it is amazing!!!! I didn’t have hemp seeds, so i didn’t put any in the recipe but it is just out of this world!!! Def going to do it again!! I would love to try these. Can I use chia seeds instead of hemp seeds? Hi Jayne 🙂 I would just use more ground walnuts instead of the hemp seeds (not chia seeds). Hello, I’d like to try the amazing brownies! They look so tasty and healthy! Thank you so much for the recipe and looking forward to new goodies! I am so glad you like the brownies 🙂 Thank you for your comment! I hope they turn out great for you when you get a chance to make them. Great recipe ! Can i use figs instead of dates ? Hi Isabella 🙂 Figs will change the taste slightly (just because figs don’t taste like dates 😉 but it will work. So yes, you can! Hola amiga ,e encanta todos tus videos ,tengo un problema q no le entiendo al idioma inglés …podrías traducirlo al español ….muchas gracias ..desde Argentina ….!!!! !te admiro ….hermosa !!! What consideration was on your mind when you decided on hemp seeds? Was it texture, taste, crunchiness? Just curious what goes into the decision on such additions to the recipe. Many thanks for the great recipe! I am grateful for your creativity. Hi may I know the exact grams for the medjool dates you’re using on the above recipe? It stated 3 cup of medjool dates on the recipes does it meant that it’s about 750g of medjool dates? I tried them yesterday a they turned out well! Unfortunately, I didn’t have hulled hemp seed so I had to use natural ones and the brownies are so crunchy now! I also had a quite hard time blending the whole mixture together, but I propably have worse food procesor However, they taste great and next time I’ll do them out of a double quantity. Hi Karolina. I am so glad the brownies turned out well for you 🙂 Yea, whole hemp seeds are definitely CRUNCHY! Hulled hemp seeds were created to make eating hemp seed more appealing and easier to eat. If you make these brownies again (and don’t have access to hulled hemp seeds), you can just use more ground walnuts. The hemp hearts are not an essential ingredient – they are there to add more nutrition. + the dates I’m going to use are the small-dryish-kind – would you suggest soaking them first? Any chance I can use cocoa powder in this? I know it’s not raw (I’m not raw) and not as healthy, but I’d love to try this recipe out. I only have cocoa power on me right now though. Okay, so I just made these and DELICIOUS! I’m so tempted to eat it all now. Haha. Thank you! Is maple syrup necessary? Also, I melted coconut oil and mixed it with a cocoa. I put that on brownies and put them in freezer, but when I took it out some white things were on chocolate, I guess coconut oil was on the surface. The chocolate came out very messy. Can you substitute pecans for walnuts? Also could I swap serene seeds for the hemp? I’m trying to use what I have. Oh dear, I meant sesame seeds. Hello! I am planning to try it out, but I have a question: Isn’t it necessary to soak the walnuts first? I,ve heard that they are difficult to digest otherwise. Would it be a problem if I soak them? Thanks! Perfect! Yea, Medjool dates are super soft and juicy but when you soak regular dates for a little bit, they work just fine 🙂 Thank you for the feedback! Hi Maddie – you made me laugh. Yes, flax seeds are definitely crunchy when not ground into flax meal. I add the hemp seeds in for extra protein but you can definitely just use more ground walnuts (next time 🙂 I am glad you made the recipe work anyway! I need to stop making these as I am just not strong enough to keep myself from constantly eating them!! I tried the recipe today, but I left out the chocolate on top. Instead I rolled the dough into little balls and covered them in cacao powder. They looked like pralines and tasted delicious. Thank you for always sharing such great recipes. Aw, I am so happy you liked the recipe, Hannah! Thank you for the feedback. I really appreciate it. I want to try them but my concern is the maple syrup is it sugar free? I am diabetic. Hi Daelene – maple syrup is very high in sugar. It contains 13 grams of simple carbohydrates per tablespoon, which means that it will raise your blood sugar much more quickly than a complex carbohydrate (like vegetables) would. Since there is no fiber to slow the that sugar down when it enters your bloodstream, I wouldn’t recommend it if you’re diabetic. Hi; what can I substitute with coconut oil? I am about to try this but i don’t have coconut oil. Also does the coconut oil suppose to not good for you? What can I substitute with coconut oil? I about to try this but I don’t have coconut oil. Also does the coconut oil suppose suppose to not good for you? I really want to try it with chocolate top. Just can’t think of any option. Hi; thanks for your reply and suggestion and info. Sorry about sending it twice. I thought the first message didn’t work. So, I did make the brownie today and I loved it even without the chocolate topping. Delish!!! My husband loved it too! But, he suggested I should go for the topping next time. I didn’t waste any time, went to store and bought the coconut oil (can’t find the cacao butter) I figure why not try. I am not going to use the whole bottle of oil anyway. So there you go. I’m excited to put the topping soon! Thank you again!! Great recipe!! Hi Petra! Do you think I could use some liquid stevia instead of maple syrup in the frosting? As for the cacao butter in the frosting instead of coconut oil, do I use the same amount? Thank you in advance for the reply! Hi Petra! Eventually I decided to use maple syrup in the frosting. The brownies were awsome, although I think I must have overprocessed the mixture a little because they are a bit oily. No big deal though, they still taste delicious! There is something else I wanted to to ask you, concerning an other recipe. I can’t seem to find your almond cheese recipe. Could you give me the link please? OMG This is recipe IS amazing… You can’t even tell if raw or not. I used hazelnut as based, and used almond for the cruch. Hi! It looks delicious. Do you think I can use honey instead of maple syrup? Your recipe sounds awesome. The problem is that I live in France and cup measurements are unheard of here. Any chance you could convert it into grams or even British ounces? Would you call these a healthy option? It’s very easy to get a bit carried away with these. Hi Laila – I would say that these brownies are healthier in that they contain no refined ingredients. However, refined or not, it’s still a dessert. Hello , thank you for this amazing recepie ! I just made it and the taste is simply divine . 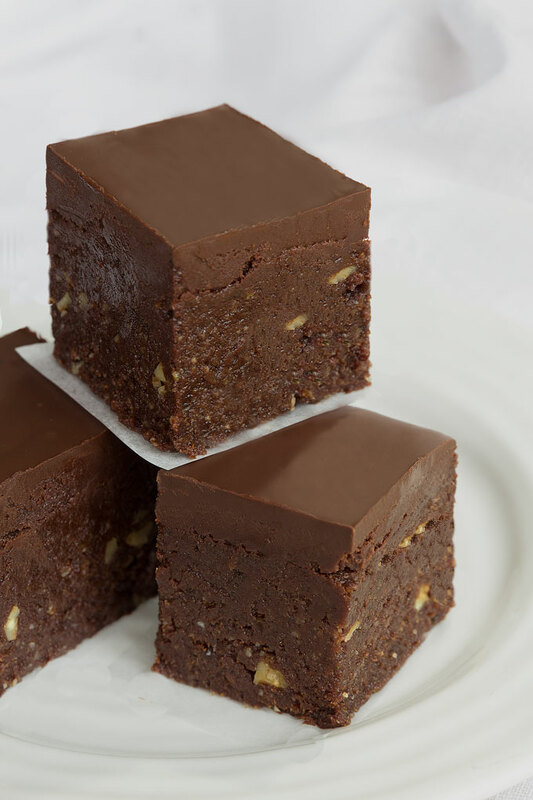 Best brownie ever – so moist , chockolaty , delicious ! Can I use car on powder instead of cacao powder. If so would it be the same measurement? Thank you and really enjoy your recipes! Sorry for the typo can I use carob powder instead of cacao powder and if so would it be the same measurement? Hi Jerome – you can replace the coconut oil with melted cacao butter. It looks so good ! I have just one question : Can I use honey instead of maple syrup ? Or it will completely change the taste ?